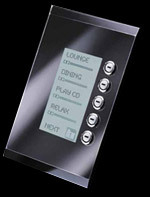 Home Automation is the combination of different control systems in the home and making them interact as one unit. C-Bus allows the control of all electrical devices within the home, “not just the lights”. Energy efficient this system extends the life of your lights as well as controlling them automatically, to save you money on running costs. Our range of alarm systems start from a basic domestic type panel right up to intelligent home management systems, costumed designed to your needs. Connecting to your alarm system, access control allows you to enter your home or business with out the use of keys, Also disarming or rearming your alarm system. Access can be either by a card or fob type reader or by remote control, and a combination of both systems the choice is yours. Allow the home owner to speak and see who is at the front door or gate, also allowing them access via a push of a button. There is a huge range of simple black and white to Colour units in varing styles to suit your décor. Roller Doors and other third party devices can be controlled and enhanced when attached to any of these systems. Allowing remote control of the Roller Door, disarming the alarm system and brining on your house lights to welcome you home. Allowing remote control of your curtains, automatically closing when you arm your alarm system or open when your return. Automatically closing when you want to watch your home theatre. Automatically turning off when you arm your alarm system or on when your return. Irrigation can also be connected, allowing the control by an alarm system, touch screen or remote control.